Huma Maqsood is iris’ co-founder and managing partner. She brings more than 20 years of leadership and expertise to iris core competencies of research, training, and brand activation. Prior to co-founding iris, Huma had a successful career in diverse management roles. She was part of the World Bank Task Force on restructuring the Punjab Education Department, serving on the research team that studied the entire primary- and middle-school system. 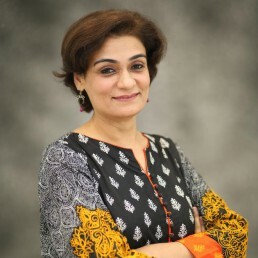 As a manager with Tetra Pak Pakistan for three years, she demonstrated her leadership skills by overseeing the process of ISO 14001 accreditation, an internationally recognized framework to manage the short- and long-term environmental impacts of an organization’s products, services, and processes. Tetra Pak Pakistan was the first organization in Pakistan to attain ISO 14001 accreditation . Huma is a certified trainer for Franklin Covey South Asia and has taught graduate-level courses at the Lahore School of Economics. She earned a master’s in business administration in 2011 from the University of Melbourne.